Actually, there aren’t too many pix for this installment, since many of them came out blurry. Besides, although the panels we went to were great, there isn’t anything really exciting about a photo of group of people sitting along a draped table—”you had to be there” really applies in such cases. Anyway, here’s a rundown of the panels and other scheduled events we attended (unless otherwise noted, each event lasted for an hour). What They’re Saying About You: How Marketing Segments and Targets Gamers (10:30 AM, Raven Theater) – The title pretty much says what it was about. Marketing ideas, trends in research gathering, the peculiarities of marketing to the PAX crowd, and so forth were discussed for an hour in front of a small but interested audience. 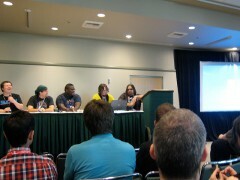 The stories and insight from Pete Hines, the don’t-call-him-a-marketer from Bethesda, was the highlight of the panel. 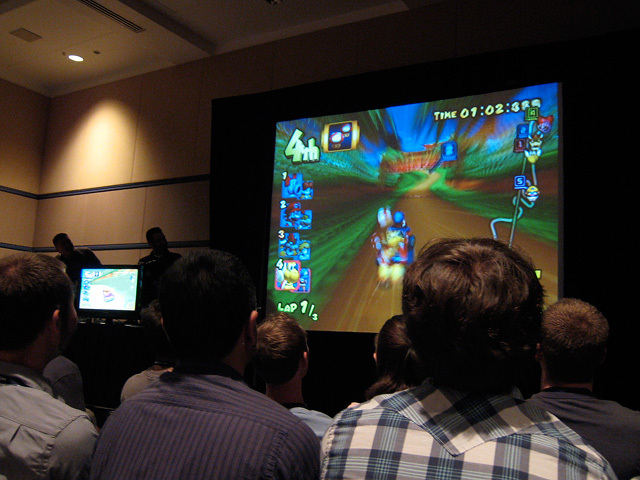 Omegathon Round 1 (2:00 PM, Wolfman Theater) – The first round of PAX’s ultimate gamer competition consisted of some madcap rounds of Mario Kart: Double Dash! 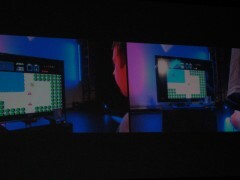 An extra bit of chaos was added when it was revealed that the players wouldn’t know which of the five screens they would be playing from, and even this was switched up on each new track. At the end, four Omeganauts were eliminated, but for two of them, their fate was only determined after a tie for last place and a sudden death round. 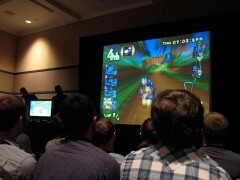 The PAX crew stuck to random maps for this round, though the audience really wanted to see them duke it out on the game’s version of the infamous Rainbow Road. Retrogame Roadshow: Are Your Old Games Buried Treasure? (5:00 PM, Unicorn Theater) – A panel tailor-made for collectors, with the audience bringing up various rarities to show off while the panelists debated their value. Among the highlights were an NES obscurity titled Panic Restaurant and an extraordinarily rare port of M.U.L.E. (I believe it was the IBM PCjr version). 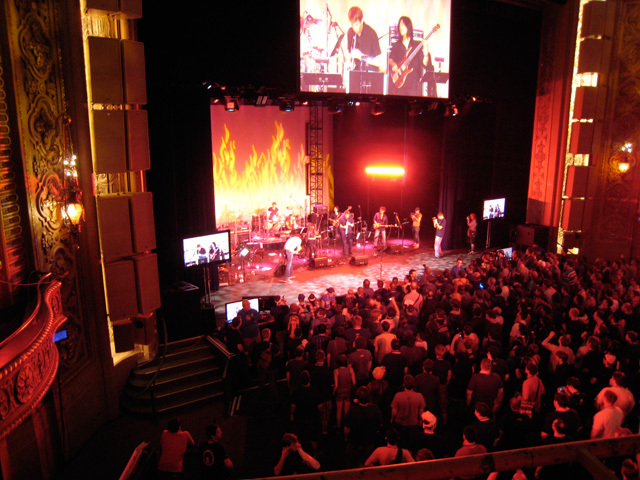 Friday Night Concerts (8:30 PM ~ 1:00 AM, Main Theater) – This was our biggest must-see of PAX, mainly due to favorites the Video Game Orchestra (see PAX East 2010, Part Two) and the Minibosses (who we had never seen live before). Sandwiched in between were MC Frontalot and Metroid Metal. The entire concert was awesome, and a lot of fun. I especially liked the inflatable metroids that Metroid Metal tossed out to the crowd for them to bounce around in the air (though said metroids wound up on stage more than a few times). Most unexpected moment: the VGO playing tunes from Plants vs. Zombies and Angry Birds! Infinite Respawn: How Gaming Can Keep & Save Your Relationship (10:30 AM, Serpent Theater) – Now here was a topic very near and dear to our hearts: love and gaming. Though many of the panelists’ experiences didn’t quite match up with ours—in part since neither of us are inclined toward multiplayer or co-op—there was a lot else that was the same, and it was comforting to know that our experiences aren’t unique. 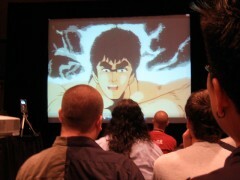 Discover the Forgotten Masters (12:00 PM, Serpent Theater) – This panel, which opened with two very amusing Fist of the North Star clips, was presented by the two guys behind GeekNights. Although some of the info presented wasn’t as obscure as they had perhaps thought it was (such as who David Crane is, or what the NES game Spy vs. Spy is like), I still learned a few things and was introduced to some fascinating retrogames, ranging from a gunslinger game (Outlaw for the 2600) to a multiplayer airline management sim (Aerobiz Supersonic for the SNES). 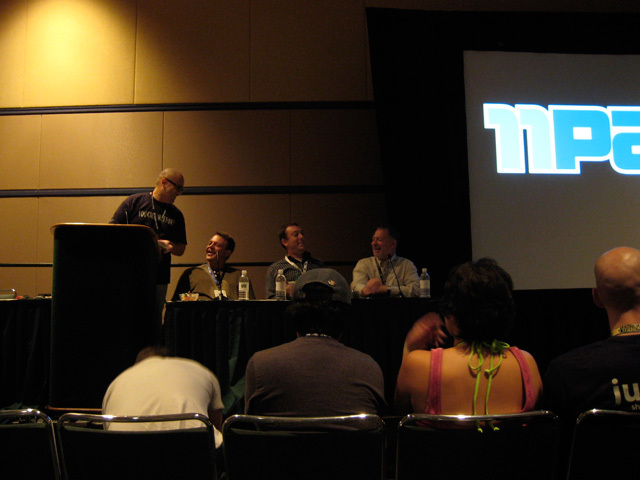 I also agree with the point of the panel: that there’s a lot of old ideas in gaming that are ripe for revisiting. You Call That Fun?! (6:30 PM, Wolfman Theater) – This was a lively panel where four friends and game industry colleagues came together to discuss that most intangible of game qualities, “fun”. One of the most interesting parts of this panel was the discussion of difficulty and how it needs to be optimized for the player’s needs; for instance, a bunch of developers who have become experts at the game they’re making are hardly the best judges of difficulty. King of Chinatown (10:00 PM – 11:30 PM, Serpent Theater) – Thanks to some technical difficulties, this screening was delayed for over half an hour. Anyway, King of Chinatown follows Street Fighter IV player Justin Wong and his rise as a pro-gamer, but that’s only half the story. The other concerns the group Justin was a part of, Empire Arcadia, and its founder, Isaiah Triforce Johnson. Triforce was already known to me as a fixture in the NYC gaming scene—I first became aware of him at the Wii launch, where he was at the head of the line, several feet away from our group—but I had no idea of his role in the pro gaming scene. Without giving too much away, this film is fairly even-handed, but does not paint Triforce in a favorable light. Despite some muddy sound, it’s a good indie documentary, and worth checking out. Making Art from Art (12:00 PM, Raven Theater) – A panel by a bunch of nerdcore rappers and one fanfic writer about all fan-made derivative works might seem somewhat imbalanced, but despite the lack of discussion about the (admittedly enormous) realm of ROM hacking, fan mods, and fan/doujin games, they handled the topic well enough. 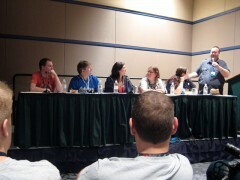 During the Q&A, an audience member brought up the topic of female fanworks makers twice. The first time, the all-male panel addressed it well enough, I thought; the second time was redundancy defined, though it was clear then where her tastes lay (mentioning Pixiv but not deviantART was a sure sign), and I could swear she referenced Vocaloid fandom without saying the word once. There’s one at every con, I guess. Insider Insight: Awesome Video Game Data (2:30 PM, Kraken Theater) – This was probably my favorite panel of the show. Presented by EEDAR President Geoffrey Zatkin, it served as a brief glimpse into the world of video game research and data. Lots of statistics were presented, ranging from trends in the music game genre to the likelihood of games with ninjas showing up on the Wii, painting a fascinating picture of what the video game marketplace is really like. 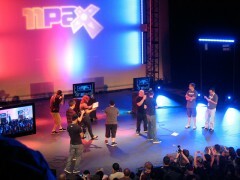 If this talk is repeated in some form for a future PAX, I highly recommend it. Omegathon Final Round (5:30 PM, Main Theater) – And at last, as “The Final Countdown” came over the sound system, the remaining two Omeganauts took to the stage. 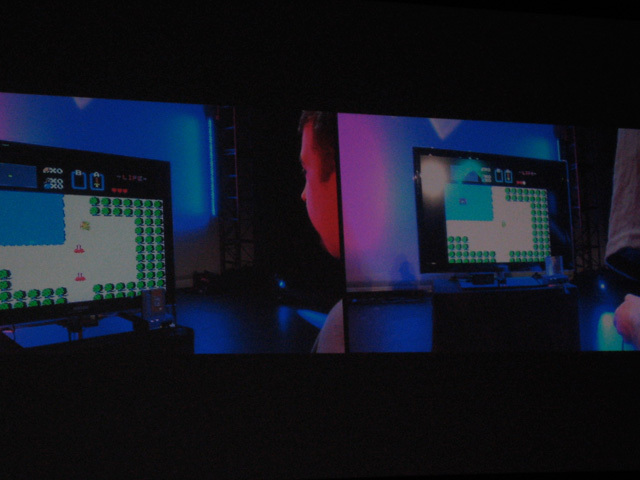 Each finalist chose a “spirit animal” from the group of disqualified Omeganauts, and Tycho and Gabe teased the game as one having space marines, racecars, and gazelles. Of course, it was no such game. Instead, much to everyone’s surprise, it was The Legend of Zelda! The goal was to be the first to obtain the first Triforce piece, and their helpers’ role would be to guide them along with the help of an FAQ. It was a really exciting match to watch, and once a winner was declared, the show was wrapped up and officially ended, and we headed out to the Console Freeplay area for some last-minute Child of Eden and eventually dinner. And now that I’m back at home, guess what I started recently. Yep, The Legend of Zelda. This is the first time I’ve ever played a Zelda game, by the way; as of this writing, I’m up to three Triforce pieces and am currently after the fourth. Such is the hold that PAX has on me, I suppose. In our next installment: WORF WORF WORF.